The Mathematical Association of America (MAA) presented Professor Greg Frederickson with a Pólya Award at its annual Mathfest meeting held on August 6-8, 2009 in Portland, Oregon. Established in 1976, the George Pólya Award is given for articles of "expository excellence" published in The College Mathematics Journal. Frederickson received the award for his 2008 article, "Designing a Table Both Swinging and Stable." The award citation describes his work "as a delightful article, which presents a whimsical application of plane geometry as a carpentry problem. Except that Frederickson has done the carpentry!" 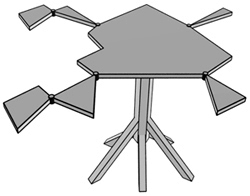 In the article, Frederickson analyzed previous designs for tables whose tops can be swung around to form either a square or an equilateral triangle. Identifying problems of leg stability and hinge strain in those designs, Frederickson then altered the designs to produce a pedestal table with a hinged top that relieves most of the potential strain on the hinges. The citation noted that, like any good applied mathematician, he also considered finer details, such as where to put the hooks to hold the two configurations together, and how to cut the wood so that its grain lines up in an attractive pattern in both configurations. It concluded, "just reading the article will make you want to go out and construct the table yourself!" Frederickson joined Purdue in 1982. His research interests include the analysis of algorithms, with special emphasis on data structures and graph and network algorithms. He has published three books, Dissections Plane & Fancy, Cambridge University Press, 1997, Hinged Dissections: Swinging & Twisting, Cambridge University Press, 2002, and Piano-Hinged Dissections: Time to Fold!, A K Peters, 2006. He has been recognized as one of the Top Ten Outstanding Teachers in Science, was inducted into the Purdue Book of Great Teachers, and also received a George Pólya Award in 2004. He is only the third person to have won a Pólya Award more than once.